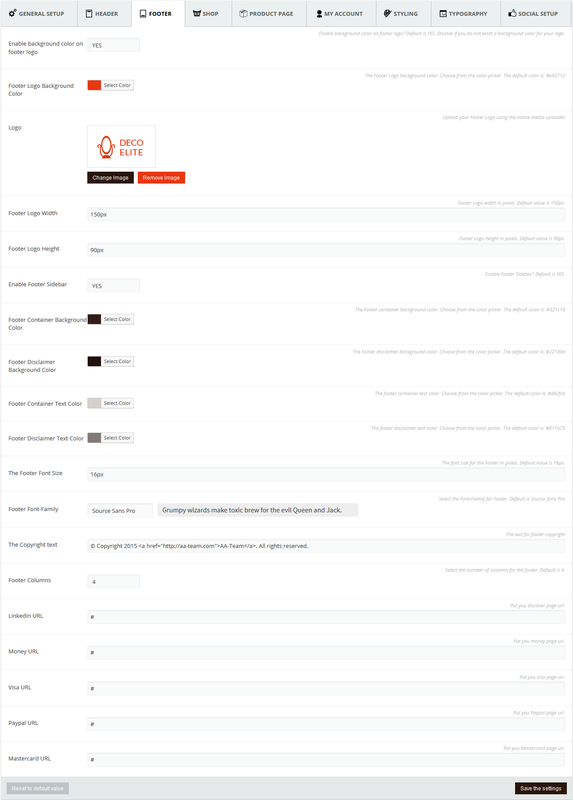 We have a lot o options in the theme’s Layout page (Appearance DecoElite WordPress Theme LAYOUT). From the General Setup tab you can change the Favicon, Main COntainer Width, Enable Facebook Like and Share on pages, Facebook App ID, Enable comments on pages and Select the project page. From the Header tab you can choose to Enable Sticky Header, Enable Top Navigation, Enable Cart, Change the Logo, Set the Logo’s width and height, Enable a Background color for the header’s logo and select that background color, Change the Phone Support text. Change the Top Menu’s Background Color, Text Color, Font Size, Font-Family. Change the Main Menu’s background, text color, hover color, font size, font-family, top spacing, bottom spacing, margin and padding. From the Footer tab you can Enable a background color for the footer’s logo and select that color, Change the footer logo and set it’s width and height, Enable footer sidebar. Select the footer’s container and footer disclaimer’s background color, text color, font size, font-family. Change the copyright text, set the numbers of columns of the footer. Change the LinkedIn, Money, Visa, PayPal and Mastercard URLs. If you empty this url’s fields, the icons will not appear on your website anymore until you put some content in them. 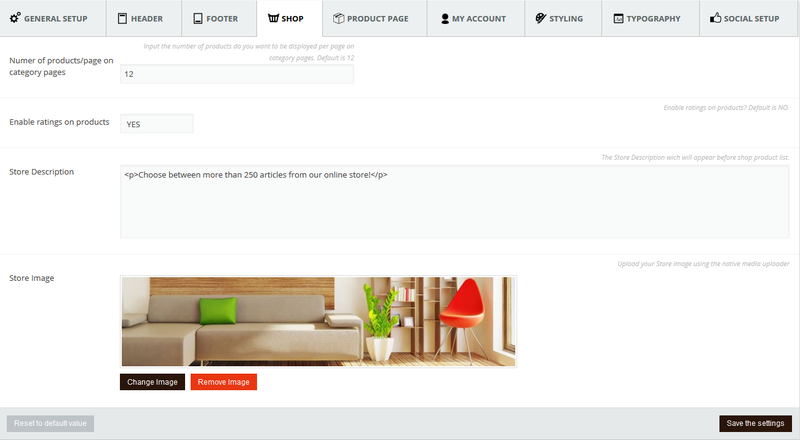 From the Shop tab you can set the numbers of products that you want to show up per page in any category type page. 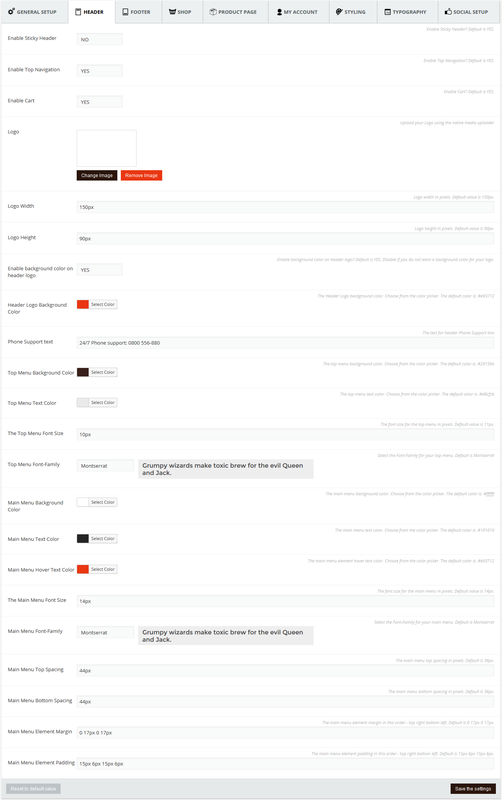 Enable ratings on products, change the store’s description and the store’s image. From the Product Page you can Enable the complementary products section and Other collections section. From the My Account tab you can set the Registration and Login Content. From the Styling tab you can change the Main Container color. Change the Primary, Secondary and Tertiary Color. Change the background image and it’s fit on your website. On the Typography tab you have the options to change the body, headers and intro font-family. And on the last tab you have the Social Setup. Here you can change the link for all your social icons. If you don’t want a certain icon on you website just empty that icons field and save the settings. That will hide that certain icon.